Over the last decade, in the United States, the political landscape has shifted dramatically. No longer are the socialists hiding who they are. The masks are coming off. Alexandria Ocasio Cortez, for as much as she demonstrates a real ignorance of basic economic principles, has identified herself as a Democratic Socialist and she has millions of online followers who support her ideas. Across the nation, there are untold millions of college kids who are being indoctrinated in the glories of socialism and Marxist ideologies. Capitalism is seen as an immoral system that brings about misery. According to a Gallup Poll, as many as 57% of Democrats support socialism over capitalism. But where is all of this support stemming from and why is it appealing to give the State more and more power while eroding the rights of the individual? The answer, as we often see about the Left, is that this is an emotional argument. It can be best understood by examining the heartwarming Charles Dickens classic A Christmas Carol. It’s Christmas Eve and Scrooge has a clerk working for him named Bob Cratchit. Realizing that it would soon be Christmas, Scrooge begrudgingly gives Cratchit the day off with pay and grumbles about being pick-pocketed as he does so. You could simply say that he is a horrible boss, an uncharitable soul, and an all around awful human being. Before being visited by the spirits and receiving his redemption, Scrooge had a demonstrable knack for making people’s lives miserable. Scrooge is sort of the Mrs. Burns of the Christmas stories. He is also the exact concept of what the socialists of America are fighting against. He has become the boogeyman that they are rallying their online pitchforks and mobs to stop. Again, AOC demonstrates she doesn’t know what she’s talking about while at the same time making a moral argument for socialism. Ringworm is a fungal condition that is not necessarily associated with poverty. You can get ringworm from using a piece of exercise equipment after someone else who has it without wiping down the equipment at the gym. However, we understand what she’s trying to say. 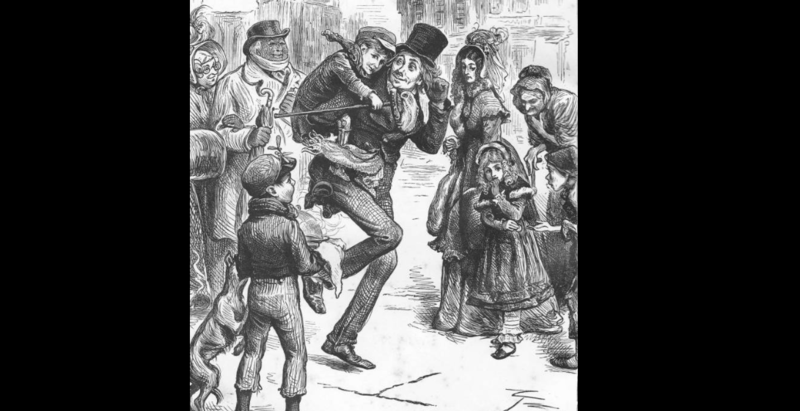 You can’t be a moral society if you have misers like Ebeneezer Scrooge, who count their pennies all day long, while people like Bob Cratchit are living in poverty. This would be understandable if we were talking about a zero sum game in terms of the amount of wealth in the United States, but the “pie” analogy does not work because those with too little pie have the individual freedoms to create more pie. In America, we are (supposed to be) protected from the State deciding that we have made too much money and need to spread the wealth around a little bit. If you want more of the pie, simply create a product or service that people want and you will create wealth. The free market, in conjunction with the individual liberties laid out in the Constitution, is a recipe for success that anyone in the country can use. The socialists of America are pushing the notion that the wealthy have “too much” and that money needs to be redistributed. This is the heart of their argument. It takes on the form of programs like free housing, free education, and free health care for all, but the basic premise is that we need to take from those who have money and give it to those who do not. When you combine that philosophy with a character like Ebenezer Scrooge (prior to his redemption), it’s easy to see why millions of young people are being drawn towards socialists like Alexandria Ocazio Cortez. It becomes the classic tale of “Good vs. Evil.” The wealthy Ebenezer Scrooges of the country are the Evil because they are portrayed as greedy and uncaring of the plight of others. Therefore, the Good would be the socialists because they are trying to do something about the rich. Socialism is, and always will be, an proposition based on emotional arguments.